Mark your calendar for our annual Halloween Open House! We’ll be offering free giveaways, snacks and drinks along with special one-day only deals on BOTOX®and JUVÉDERM®. Appointments can be made in advance for that day. – Purchase 30 units of BOTOX and receive 10 free units. – Purchase 1 syringe of JUVÉDERM Ultra® or JUVÉDERM Ultra Plus® and receive your second syringe at 50% off. 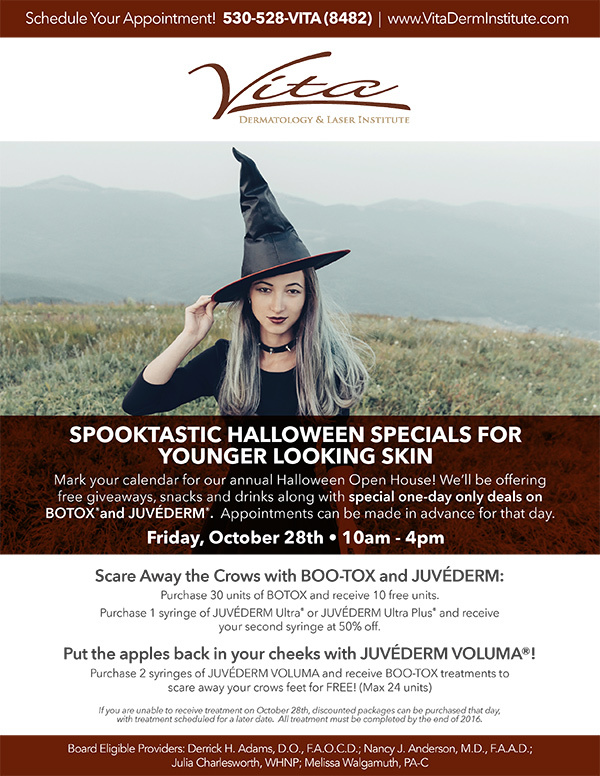 • Put the apples back in your cheeks with JUVÉDERM VOLUMA®! If you are unable to receive treatment on October 28th, discounted packages can be purchased that day, with treatment scheduled for a later date. All treatment must be completed by the end of 2016. Juvederm is a non invasive, non surgical method used to address and correct wrinkles and folds in the facial areas. Voluma is a long lasting filler that gives a very natural result, and is effective for lifting and replacing volume to the face.